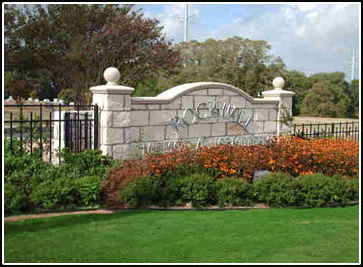 In early 2003, Henry R. Squires bequeathed more than $123,000 for a Rockwall Memorial Cemetery rehabilitation. On Monday, May 30, 2005, more than 50 area residents and city staff members gathered around the cemetery's new fountain to remember Squires, honor his dedicated service and marvel at improvements to the 130-year-old facility. Henry was the son of Maude and Marvin Squires, of Bramlett, Kentucky, who settled in Fate, Texas. Henry graduated from Rockwall High School in 1931 and married the love of his life, Hazel Hawks, in 1938. He was a produce buyer for Safeway Stores from 1936 until his retirement. He also served four years of Army service in France and Germany from 1942 until 1946. Upon retirement from Safeway, Henry and Hazel returned home where Henry began a second career as a volunteer for the Rockwall County Tax office, the driver retraining program of AARP, the Mt. Zion Cemetery Association and the Rockwall County Historical Foundation. He regularly gave talks about history, culture and life in early Rockwall County. Henry will be long remembered for his great sense of humor, his quick little tap dance routine, his devotion to his church and wife, Hazel. These Improvements to the Rockwall Memorial Cemetery were made possible by the generous donation made by Mr. Squires. May 30, 2005.